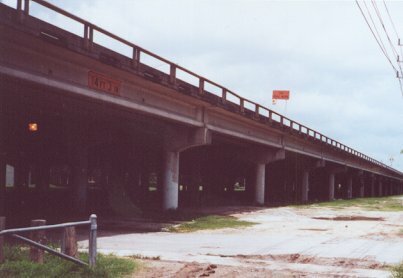 The elevated section of US59 just southwest of downtown will be depressed into a trench, with construction scheduled to start in 2002. The $65 million project is the result of negotiations with local neighborhoods which opposed the original design. 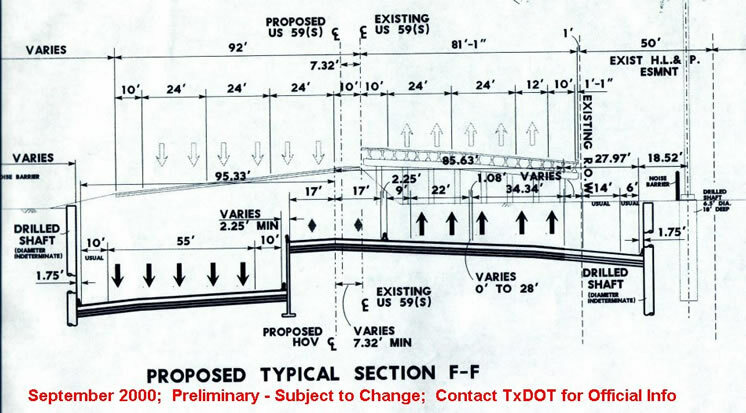 In the mid 1990's, TxDOT proposed to add a second elevated deck to accomodate the HOV lanes that were planned for this section of freeway (see image below). The local neighborhood is a high income area and is a typical "inner loop" neighborhood. In Houston, "inner loop" is a code expression for liberal political views and a more pro-transit/anti-freeway position than the rest of Houston. So the local neighborhood quickly organized against this option and enlisted local political officials in their fight. The second elevated deck was soon dead on arrival. TxDOT next proposed to make the deck wider to accomodate the HOV lanes. This still did not please the local opposition, which had other ideas. See the image of the urban deck that was promoted by the neighborhood and a local political official. It turned out that widening the deck would have required a full reconstruction because of shifting of the centerline, so the cost would have been quite high. Fortunately, the urban deck option died and it was decided to place 59 in a trench, like it already is in the adjacent section to the west. This project has the potential to cause massive traffic disruptions. Probably half of the freeway main lanes will need to be closed for long periods of time during construction. It won't be a good time to be a Southwest Freeway motorist! 1992 Reconstruction and expansion of the freeway to the west completed. 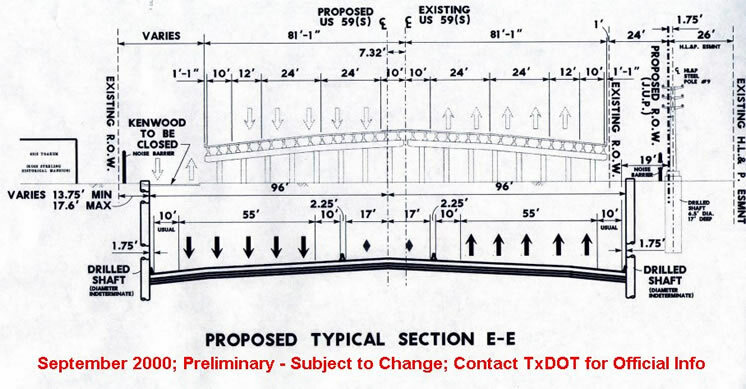 Mid-1990's TxDOT proposes improvements to this section. A compromise design is reached. 1999-2001 The depressed section of freeway just to the wast is widened and spanned by arched bridges. 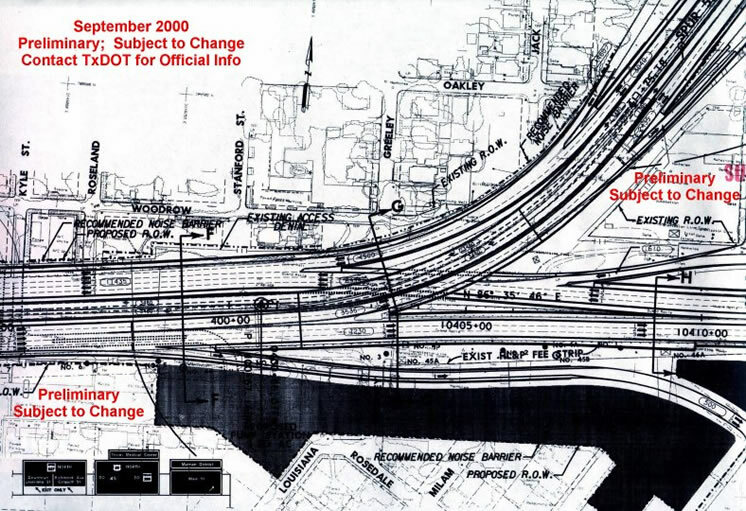 2002 Construction will begin to place the 10-lane elevated freeway into a trench. This is the existing elevated freeway. This is the existing overcrossing at Montrose Boulevard. Montrose leads to the Museum district. There has been talk of building a "signature" bridge for Montrose, but as of December 2000 I am not aware of the status of this possibility. These images show the original second deck design (left) and an urban deck that was proposed by the local neighborhood group (right). 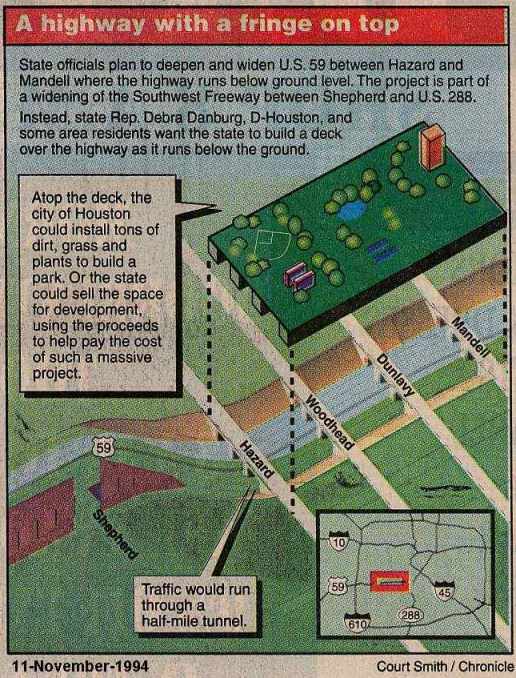 The urban deck was actually proposed for the section of freeway where the long span arched bridges are now being built. Neither design was adopted. Although these schematics are designated as "preliminary" like all other schematics prior to construction, this design is funded and any changes are likely to be minimal. A typical section of the new facility. The trench will be 192 feet (59m) wide, accommodating 10 main lanes and two HOV lanes. Unfortunately, the main lanes will be reduced an a width of 11 feet. The freeway cross section just before the Spur 527 split. It will be very difficult to keep traffic moving while this is under construction. Notice the new exit ramp to Main Street. The dark shaded area is new right-of-way acquisition that is planned as stormwater retention ponds.